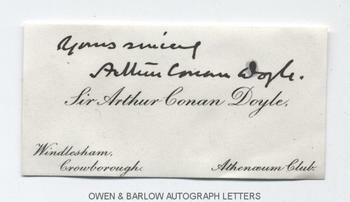 ARTHUR CONAN DOYLE AUTOGRAPH Signature on Visiting Card. English author. Creator of Sherlock Holmes. AUTOGRAPH signature and the words "yours sincerely" on his printed visiting card (3 x 1.5 inches), bearing his Windlesham, Crowborough address and the name of his club, the Athenaeum. One slight ink blot affecting the 'D' of 'Doyle' and with mounting remains on verso but in very good condition.